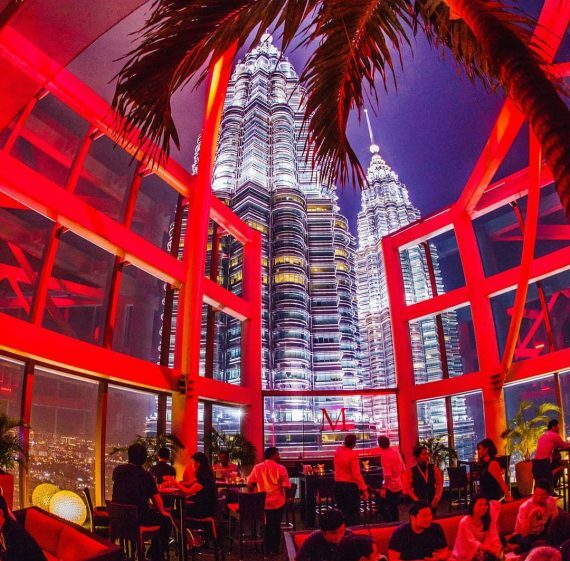 Six years after transforming Kuala Lumpur’s dining scene and really putting the Malaysian capital on Asia’s map for fine dining, Marini’s on 57 continues to impress diners with its trifecta combination of food, service, and ambiance – all masterfully delivered on the 57th floor of Petronas Tower 3. We recently visited to assess the newest menus and range of offerings from Chef Francesco Fedrighi. In addition to the full Autumn Menu, which is sure to tempt any gourmand, Marini’s on 57 has made the stunning offerings from their Festive Menus available, too, and we ordered a few dishes from both the regular menu and the set menus to test the waters and see if the food could match the spectacular view. We took our seats just as the sun was slipping below the horizon and it cannot be denied that, on a clear evening – and from such a lofty perch – the Malaysian capital city is genuinely beautiful. Clearly, living up to such a superb view is a lot to ask of a meal, but that’s what Marini’s on 57 has been doing since it opened its doors – and our expectations were correspondingly high. Making a meal solely from the line-up of antipasti dishes would be an easy thing to do at Marini’s, but we restrained ourselves somehow and ordered just two – the pan-seared duck liver dish and the Petuna ocean trout tartare. The Chef, however, surprised us by starting with the Uova, a trio of egg shells filled with three different condiments as the menu reads. 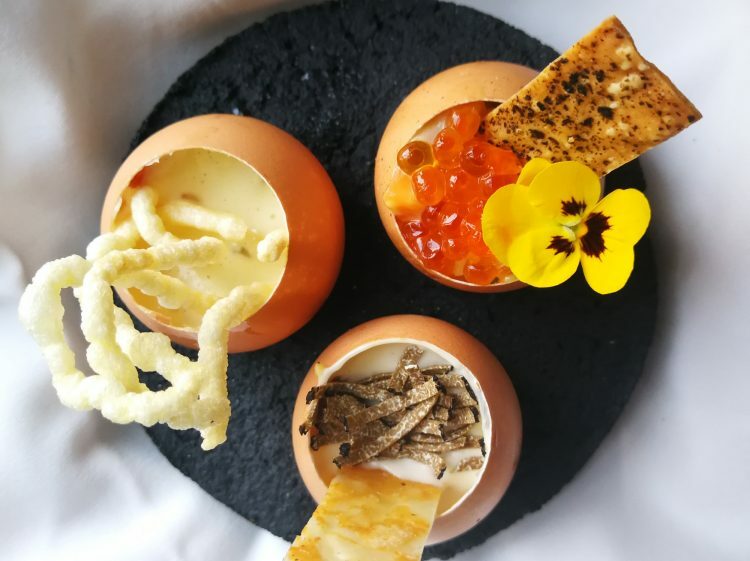 Each of our egg shells was filled with the scrambled egg, truffle, and parmesan espuma, and it was warm, delicious, and comforting. 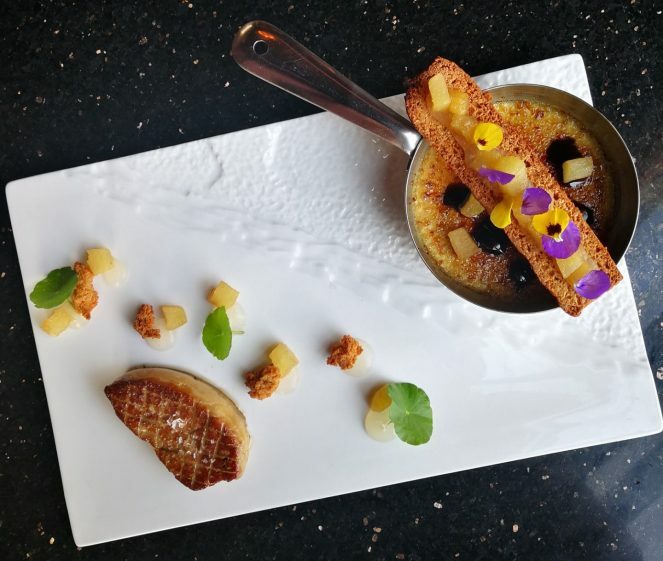 Following this, our chosen dishes arrived, and the liver dish was an absolute triumph – the generously sized and perfectly seared duck liver complemented by a pâté prepared in an ingenious manner: much like a crème brûlée. It was simply excellent; among the best such dishes we’ve had. The tartare, meanwhile, was fresh and tasty, not to mention perfectly presented. 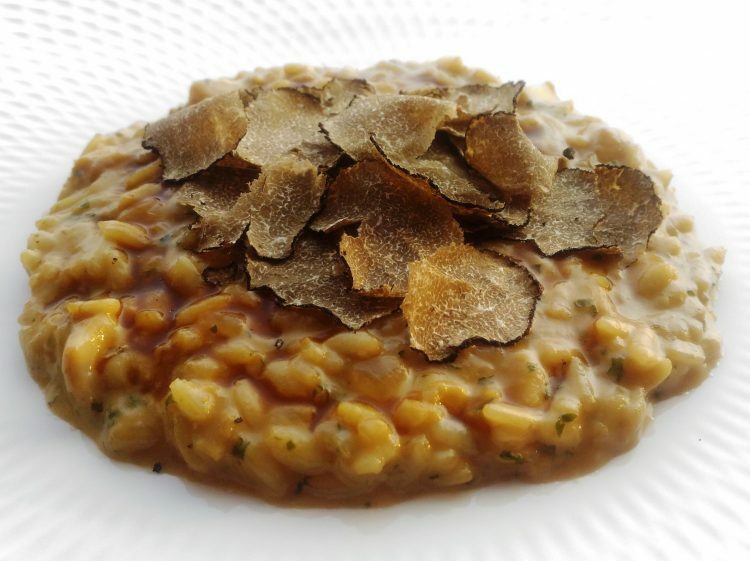 We also found the porcini mushroom risotto, prepared with beef jus and generously topped with shaved truffles, to be delectable. Risotto is one of those seemingly simple dishes that is deceptively challenging to do really well. This one was packed with earthy, comforting flavours, and the texture was very nearly perfect. For those who appreciate a nicely al dente risotto, this is a winner. The lamb dish had us over the moon. 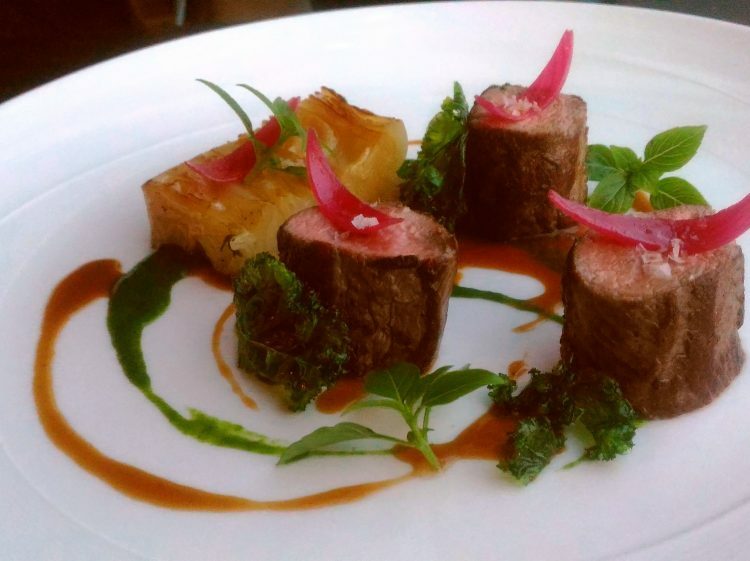 The tender, perfectly cooked lamb loin accented by kale purée and lamb jus, served with cabbage mille-feuille really hit the spot. We sampled other dishes, occasionally getting little surprise treats from the Chef, including a personal tableside visit. Through it all, but especially with the lamb loin, we enjoyed a terrific bottle of 2011 Ohau River Pinot Noir from New Zealand, just one selection from a stellar wine list that, unsurprisingly, boasts a particularly wide range of Italian wines. 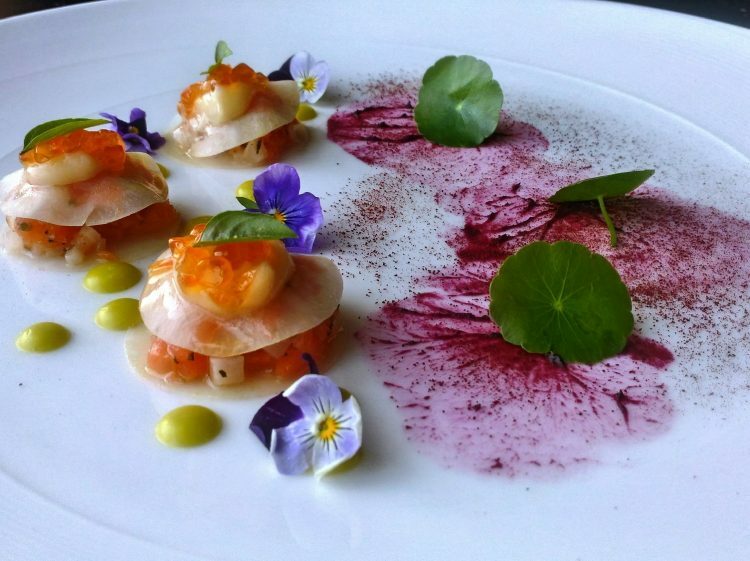 Seemingly with every plate served, from the ingredients to the preparation to the presentation, I was reminded of the creed of founder Cavaliere Modesto Marini, as he told me when I interviewed him several years ago: no compromises. It really is that simple. Of course, the level of quality is reflected in the prices, but for that, you get a dining experience that has taken no shortcuts and one which never asks you to make sacrifices. The food, the wine, the deft and efficient service that was never intrusive, and the overall feel of being in this fine restaurant – everything is top-shelf, and it’s safe to say that despite a whole lot of fresh competition coming into play in recent times, Marini’s on 57 really is as impressive now as it was when it transformed the KL dining scene six years ago. Kindly note that the full Italian menu names of the various dishes have been omitted in this review in the interest of simplicity. Thanks to the Marini’s on 57 team for having us. Marini’s on 57 will surely feature among the city’s most opulent and desirable top spots to dine and relax this holiday season, and with that in mind, the award-winning chefs here, led by Chef Francesco Fedrighi, have created a range of tempting and indulgent festive set menus. A seven-course Christmas Eve set menu starts at RM580 per person, with a six-course offering on Christmas Day starting at RM480 per person. The following week, New Year’s Eve brings along a not-to-believed 10-course degustation menu – expect to park yourself and enjoy the view for a while – that starts at RM1,157 per person. Nothing on the menu, which features Wagyu beef with a marbling score of 9 and multiple courses with both white and black truffles, is anything less than incredible, and this will surely be a meal nobody would soon forget! If you want to just chill with your friends in the bar and ring in the new year at altitude, Marini’s on 57 is offering a number of bar packages featuring G.H. Mumm Champagne, Grey Goose vodka, Tanqueray gin, and The Glenlivet single malt Scotch whisky. Whether you want a window table for two or a spacious sofa setting for up to eight, Marini’s has a package for you. To inquire about the menus or make bookings for the holiday season, just call +603 2386 6030, or make a reservation online at marinis57.com.